One of the best films of the year, Carol makes it difficult to find flaws within the precision and elegance of its two main stars, Rooney Mara and Cate Blanchett, script by Phyllis Nagy (Mrs. Harris) and direction by Todd Haynes (Far From Heaven, I’m Not There). Set in the demure, refined period of the 1950s, Carol follows the story and relationship of two women — Therese Belivet (Rooney Mara) and Carol Aird (Cate Blanchett). Both are at a lonely period in their lives: the young Therese, a pensive shopgirl, is in a stagnant relationship and is reticent about her future, while Carol is in the midst of a divorce as she struggles to obtain full custody of her daughter. Both are captivated with each other when they first meet, and an unassuming flirtation that turns into a meaningful and beautiful relationship. Carol is based on the 1952 novel The Price of Salt by Patricia Highsmith (The Talented Mr. Ripley, Strangers on a Train). Highsmith first published the book under a pseudonym due to the then-scandalous content. Her material is groundbreaking feminist work as it follows the relationship of two wonderfully developed and multi-layered female characters who make each other feel at ease and alive at the same time. It is interesting that the conflicts within the story are created by men, who constantly try to get in the way of their happiness and separate them. Richard (Jake Lacy), Therese’s boyfriend, tries to convince her to get married, even though she clearly does not love him. Harge (Kyle Chandler) is still in love with Carol, and is jealous of her relationship with Therese. Throughout the film, he keeps trying to win Carol back through guilt and blackmail, and could be considered the main antagonist. However, it’s a stroke of Haynes’ sensitive and compassionate direction that neither Richard or Harge are made out to be villains either. 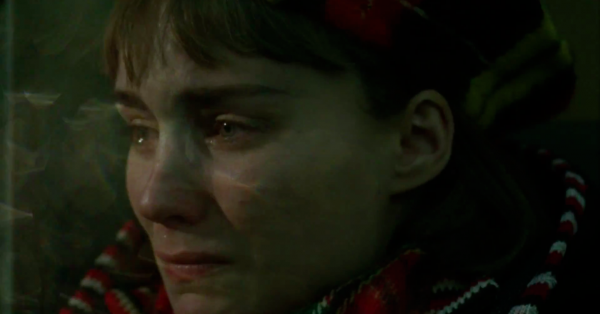 Both Rooney Mara and Cate Blanchett shine in Carol, and it is hard to tell which one gives a superior performance. 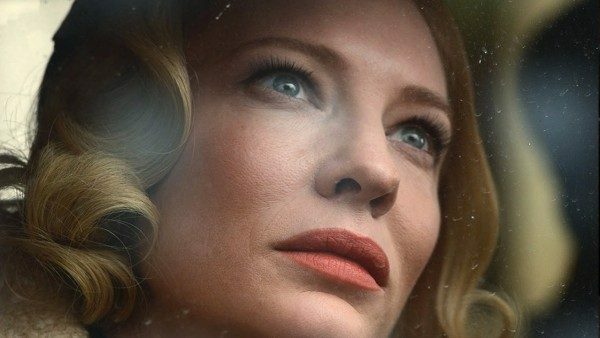 Mara plays Therese with a delicate chastity who is entranced by Carol, and discovers herself throughout the film in a way that’s unique to cinematic coming-of-age stories — she’s not your typical “lost child.” It is not hard to see why she desires Carol. Cate Blanchett makes the audience fall in love with her seductive, alluring elegance and husky voice, and strikes the difficult balance between a character introduced as an idealized expression of femininity and a fully-faceted woman. When Blanchett and Mara are on screen separately they are still radiant, but when they are together, their chemistry and magnetic attraction exude life, lust and sexuality. Their scenes crackles with electricity and are the best parts of the movie. Yet Carol‘s artistic success comes from more than just the quality of the performances and the compassionate renderings of the characters. The score is the perfect backdrop to the film and the characters. It is hard to imagine music that more accurately encompasses Therese and Carol’s feelings for each other. Carter Burwell was able to create haunting and stirring melodies that capture the innocent and newfound desire in their relationship. The score is complimented by the wonder that is Phyllis Nagy’s script. Her dialogue is real and organic, and slowly draws out the achingly palpable feelings of each of the characters. Nagy is able to create a strong and powerful connection between Therese and Carol without using too many words; it is an incredible feat. The two characters easily slip into a comfortable and natural bond that needs no explanation or discussion from them or the audience. All of these elements come together to make the audience deeply feel what the characters feel. The brilliance in Haynes’ direction lies with his decision to let the certain moments linger too long, echoing the sense of longing the characters have for each other. Therese and Carol yearn not only for each other, but for the desire to be understood and loved, which they find in each other. Their stirring connection is the heart of the movie, and that is what makes this film fantastic. Everything else is secondary. A must-see; Todd Haynes has created the best film of the year so far. 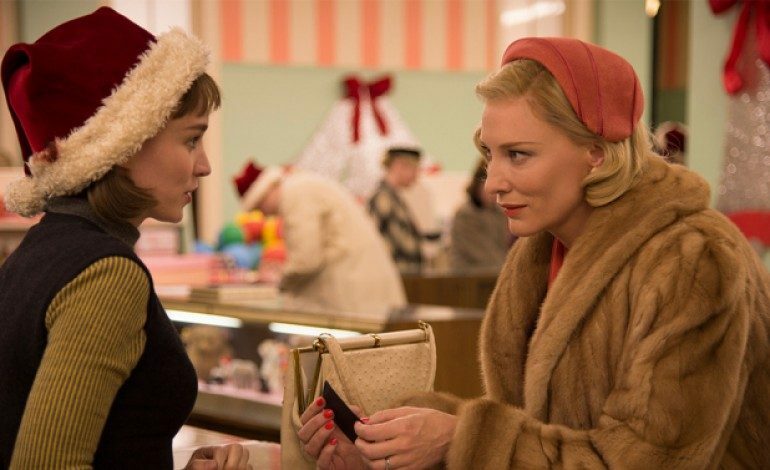 A breathtaking and sophisticated film, Carol is a modern triumph of a love story. Every part of the film speaks to the audience with an emotional clarity and resonance that will make you think and feel vividly even after leaving the theater.